Don’t you wish to plot all your travels on a world map? For some time I was checking for best way to plot my travel on a map. Google map allows only 10 destinations per map. There are many other mapping tools – some you’ve to download, few others you’ve to pay and so on. Of various tools I could try out, I find great circle mapper most convenient. You just have to enter the airports in sequence and GC Mapper will draw the relevant map for you. It will resize the world map to suit the destinations you’ve visited. Also there’re multiple themes to select from. Great Circle mapper also gives a total of how many miles you’ve flown. Some drawbacks- no option to save your map. You’ve to save airport sequence locally if you wish to reuse it later. Also if there’s an error going back may not work. You’ve to copy airport sequence from URL, correct the mistake and try again. Also you should recall airport codes of all airports you’d like to use. If you’d flown very little but have done extensive hiking, road trip etc then GC mapper may not be your best choice. You can play around and create a flight map for your travel. There is no limitation on the length- you can enter hundreds of airports. 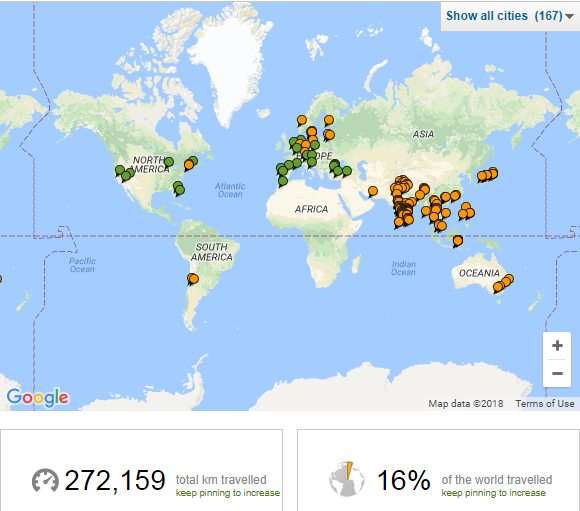 Tripadvisor has a map view of all the cities you’ve been to and it tells what percentage of the world you’ve traveled. Are you aware of any better tool to create your flight maps? Do share in comments below. Thanks. It would be great if you could correct the name.